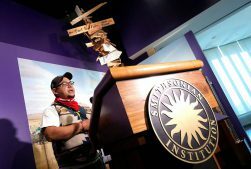 Unveiled in October, the Smithsonian Institution’s National Museum of the American Indian showcases a monument spontaneously built by hundreds of indigenous tribes during what historians call the largest gathering of Native Americans in protest in history. 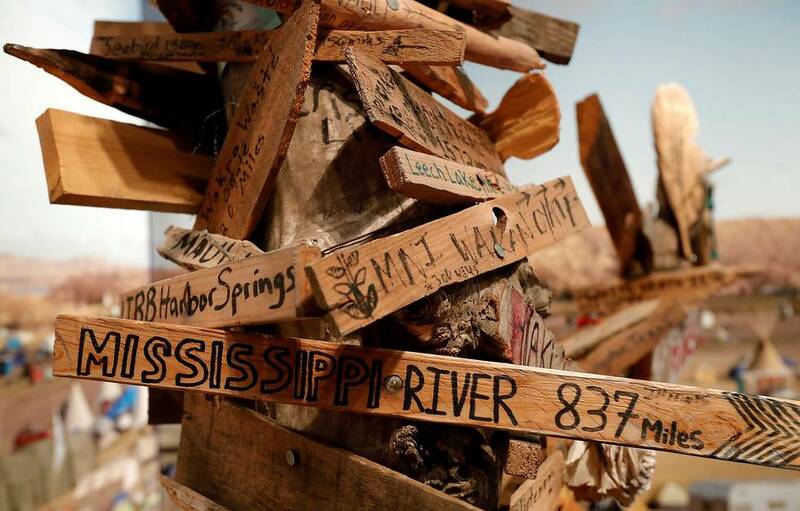 An 11.5-feet-tall milepost from the months long Dakota Access pipeline protests is the newest and final addition to the museum’s major exhibit Nation to Nation: Treaties Between the United States and American Indian Nations. 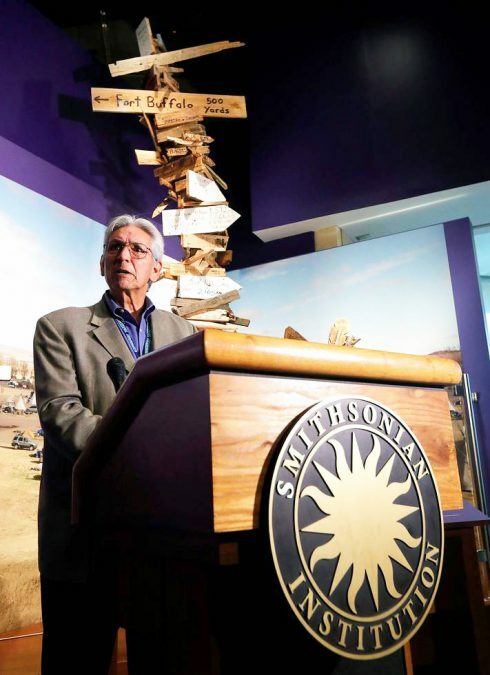 “Part of the point of Nation to Nation is that the treaties in the exhibition remain alive and influential,” Kevin Gover (Pawnee), NMAI director, said in a media statement. The Dakota Access pipeline protests, which spanned April 2016 to February 2017, grew to include more than 12,000 activists and members of more than 300 federally recognized Native American tribes. They gathered to protect water resources and sacred sites from the construction of a portion of Energy Transfer Partners’ Dakota Access Pipeline, which would carry an estimated 570,000 barrels of oil a day under Lake Oahe and contested Standing Rock Indian Reservation land in North Dakota. Nation to Nation runs through 2021 at NMAI on the National Mall in Washington, D.C. The Horse Creek (Fort Laramie) Treaty, also part of the Nations to Nations exhibit, was signed in 1851. It outlined land boundaries for northern Great Plains Native nations, including the Sioux. In 1868, another treaty guaranteed “absolute and undisturbed use and occupation” within the revised boundaries of the tribal nation’s territory. Struggles to protect these rights, resources, lands and tribal sovereignty have persisted ever since. Additionally, Lake Oahe — the site and natural resources the Sioux fought Energy Transfer Partners and the U.S. Army Corps of Engineers to protect — was created in the early 1960s by an Army Corps dam project. The Oahe Dam flooded and destroyed 90 percent of the tribe’s timberland, as well as vast swaths of “most fertile bottom lands” and wildlife, Everett J. Iron Eyes Sr., a water consultant and former Standing Rock Sioux Tribe water and natural resource director, told The Washington Post in late November 2016. Protests, pleas and negotiations continued, and then became more organized in March and April 2016, with the formation of Sacred Stone Camp in Cannon Ball, North Dakota. “When more than 12,000 activists and hundreds of Native Nations assembled in North Dakota during 2016 to protest the Dakota Access Pipeline, treaties were at the heart of the issue,” Gover said in a media statement. Eventually, in December 2016, the Army Corps agreed to further research tribal concerns and began its study Jan. 18. North Dakota Gov. Doug Burgum ordered all remaining protesters, water protectors and allies to evacuate camps located on federal land by Feb. 22. On Jan. 24, President Donald Trump signed an executive order supporting the pipeline’s construction. The first oil from Energy Transfer Partners’ Dakota Access Pipeline was delivered May 14. Its first leak, totaling 84 gallons at a South Dakota pump station, happened April 6, before the pipeline was fully operational.